No, it is not reruns week for K.Mandla. Back in January we had a little CLI tool named mp3rename, and now again, here’s a CLI tool named mp3rename. Two separate tools with much the same approach and results. This mp3rename, which dates back to 2003 supposedly, adds the feature of organizing the output files, in a similar fashion to mussort. I don’t recall seeing this outside of one or two other utilities. This mp3rename is a little convoluted to work with; I found I had to call specifically for the IDv3 tag to be used, or it came up with no data to sort or rename on. That might just be my files though. And it’s worth mentioning that the renaming options seemed to stutter if they weren’t explicitly listed in the command, even though the help flag suggests there’s a “default” string mp3rename will fall back to. 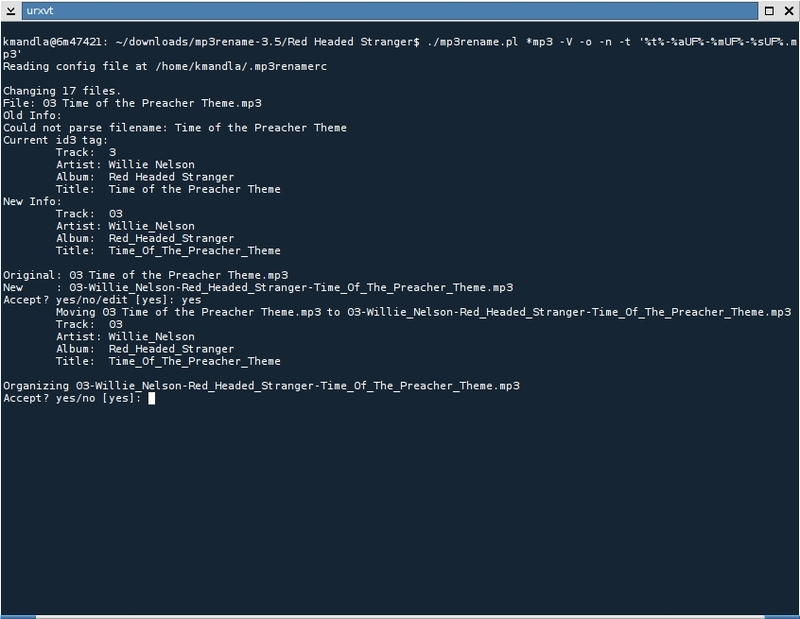 I got a lot of errors until I used one I drew up with no spaces, and tacked it on to the end of the command. If you try this in Arch, you’ll need both perl-mp3-info from extra and perl-mp3-tag out of AUR. Offhand, I’m not sure what those correspond to in Debian; my search for “perl mp3” was somewhat scattered. In all, this mp3rename — aside from the option to organize mp3s according to artist and album — doesn’t differ a whole lot from the other one. And goodness knows there are lots of other scripts, some specific to file types, that will do the same in much the same way. This entry was posted in Linux and tagged audio, file, id3, mp3, rename, tag on 2014/07/21 by K.Mandla.